These whole, extra-large stemmed Royal Harvest Bordeaux Maraschino Cherries feature a rich mahogany red color, beautiful Bing taste with a hint of tartness and a delightful crisp finish you expect from fresh cherries. These whole, extra-large stemmed Royal Harvest Bordeaux Maraschino Cherries feature a rich mahogany red color, beautiful Bing taste with a hint of tartness and a delightful crisp finish you expect from fresh cherries. Enjoy Royal Harvest™ Bordeaux with any dessert or in your favorite drink. Its robust taste complements a wide array of spirits, wines & even craft beers. Net weight 13.5oz / 383g. Do these marachino cherries have food color? 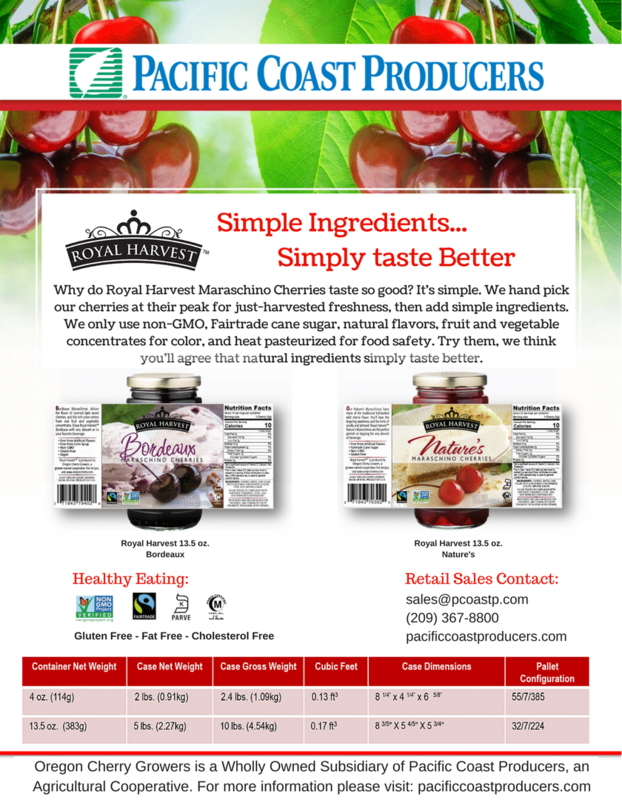 Royal Harvest uses fruit and vegetable concentrates for color.